L: 89" x W: 37.5" x H: 37"
Novella Sofa Delight in your romantic sense of style with the ornate details of the Novella sofa. Indulge in this sofa's luxurious upholstery which is as durable as it is elegant. Deep diamond-patterned button tufting lends a sophisticated feel and plush cushions makes this a comfortable choice. Rolled arms adorn the sofa and turned feet bring together classic, traditional touches. To top it off, the accent pillows, one in a cream with scrolled floral pattern and the other in a beautiful burnt sienna provides extra opulence. Delight in your romantic sense of style with the ornate details of the Novella sofa. Indulge in this sofa's luxurious upholstery which is as durable as it is elegant. Deep diamond-patterned button tufting lends a sophisticated feel and plush cushions makes this a comfortable choice. Rolled arms adorn the sofa and turned feet bring together classic, traditional touches. To top it off, the accent pillows, one in a cream with scrolled floral pattern and the other in a beautiful burnt sienna provides extra opulence. Inside Arm to Arm: 65"
This stain-resistant, easy-care fabric boasts a soft feel, yet it's tough enough for extensive, everyday use. Frame joints are reinforced with corner blocks and glue for added strength and stability. 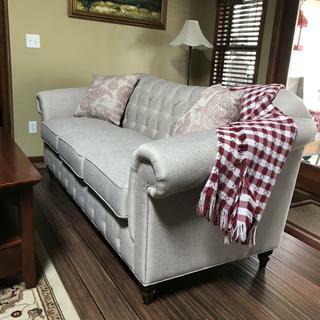 Comfortable, Cozy and Regal is what the Novella Sofa provides! My new Novella Sofa fits perfectly in my living room. The design and color enhances and balances the decor of my living room. My family and friends really enjoys the comfortable seating of the sofa. I love love that it is just enough different to not be the same ol' sofa. The back is so pretty with the "reverse camel" shap and I love the way the arm rests slope on the sides. It's also very comfortable - firm and comfortable! The style fits perfectly in my old house (built in the 1800s). Vintage but modern. Excellent not too too large so it gives you space to place something else next to it. Not too heavy to move and clean under it. The price maybe could be less. However looks and feels great ! It’s high enough so you can get up without feeling that you need extra support to get up! Highly recommend this sofa. It looks beautiful and is comfortable. Customer service was terrific at the Clearance Center and delivery was quick. Price was very good as well. Love the sofa. Loved Carmella. Great experience. This is a classy piece of furniture. I am 5’3” and I can sit in this sofa comfortably and my feet touch the floor without using a pillow. Lots of support. I am hoping that the fabric stands the test of time. Currently extremely happy with our purchase. Nice looking sofa, not very comfortable. The sofa looks great. There aren't many traditional sofas to choose from these days in the stores, and this one was the nicest looking one we found. I don't find it very comfortable. It is hard and the seat is not the right size for me. I'm small, so I have to stick a pillow behind my back to sit semi-comfortably on it. Does this come in another color? BEST ANSWER: Hello Doris, thank you for your interest in the Novella Sofa! It is only available in the fabric, Nevins-Doe, as shown on the website. Can you get this sofa in any other color? BEST ANSWER: Hi Gail. The Novella Sofa is only available in Nevins-Doe, as shown. Can I order these throw pillows? BEST ANSWER: Hello Lisa, the Novella Sofa throw pillows are not available for individual sale. You must purchase the sofa.